The magazine features loads of reviews from Merman/Ozone, Allan and the Art Ravers, as well as from some other contributors. Each page has a large in-depth details about chosen favourites. There is also a superb article �Pacman Trilogy�, plus a few choice cuts from myself. I�also read through another of Mermans' interesting articles, which was all about the General Election games and he mentioned one game, which I�own �Election Game� from Mastertronic, which cost L1.99, but I�bought it for 50�uk sterling pence :o) I�agree with the comments about all these Election games being poor. The Art Ravers contributed �The Pacman Trilogy� which is also another good read. The article is dedicated to C64 and original conversions of the games, which Namcos' superstar, Pac Man were involved. Commodore Scene would not be Commodore Scene, without any technical pages, so there is 1 1/2 pages all about arcade game play hardware, such as the steering wheels, joystick controllers, etc. ALSO the article features how possible it is to turn a PC joystick into a C64 joystick ;o) I�remember when all my joysticks broke, and I�could not code any more games, until Philip had fixed me a joypad�� from his PC to the good old machine that we love, the Commodore 64. 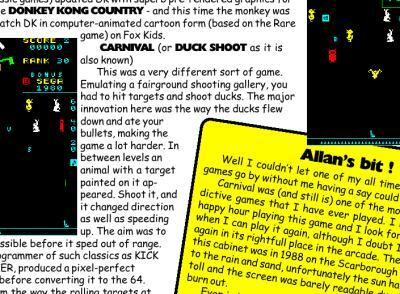 There is also a page dedicated to the light gun/joystick games by Konami. �Operation Wolf� and �Thunderbolt�. These were two great games, which were produced for the Commodore 64, as well as in the arcade. Both these games used the cool Ocean Loader with the superb music by Jonathan Dunn. Centipede (Remember) Donkey Kong (Remember) Duck Shoot (Remember) Galaxion (Remember) Gremlins (Remember) Ms PacMan (Remember) Pacmania (Remember) Ping Pong (Remember) Super Pacman (Remember) Stellar 7 (SCPU Compatible as well as normal C64) Hard Drivin' (SCPU Compatible as well as normal C64) Pac-It (Was meant to be Preview V2, but Preview V1 was used again�� oops, Allan�� clumsy ;o)) Defuzion 3 (By Me). Overall I�really found Commodore Scene and also the cover disk very enjoyable. 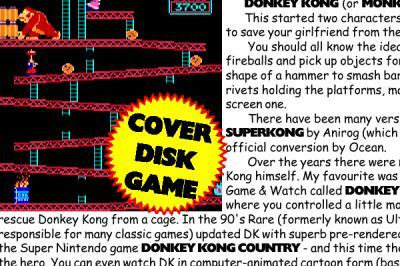 Each article has been nicely detailed and also the cover disk games. My favourite one was PacMania. Its' not to late to order your copy. Go to the Commodore Scene web site.